ULTRACAL: 1) Repairs? 2) Need to dry before sculpt? 3) Sculpting for shrinkage? I'm new to SW. I've wanted to make monster masks since I was a kid, and now as a 30 something mom, I'm finally going for my first attempt! I got myself lifecasted with Body Double on Sunday (thanks to bribing some family members). Monday I poured my Ultracal 30. Tuesday (yesterday) I demolded it, and other than a small piece breaking off of one ear, I'm over the moon with how it turned out! I sanded out some rough spots and I'm very happy with it. However, I did do a recast of the broken ear, thinking maybe I could repair things somehow. 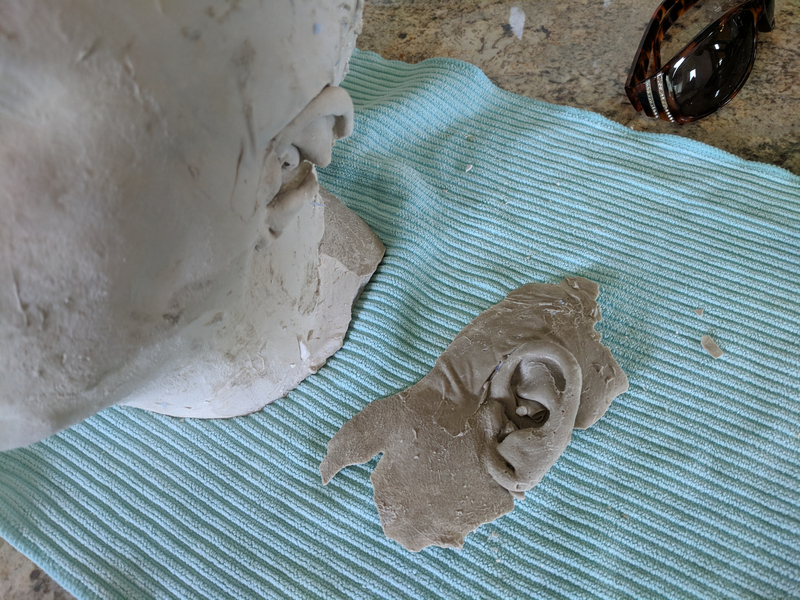 1) Is there a way to glue my existing Ultracal bust together with the separate ear piece I cast? (Doesn't have to be the whole ear piece necessarily). Is this the best way to repair it? What adhesive is best? 2) My WED clay came today (Wednesday). 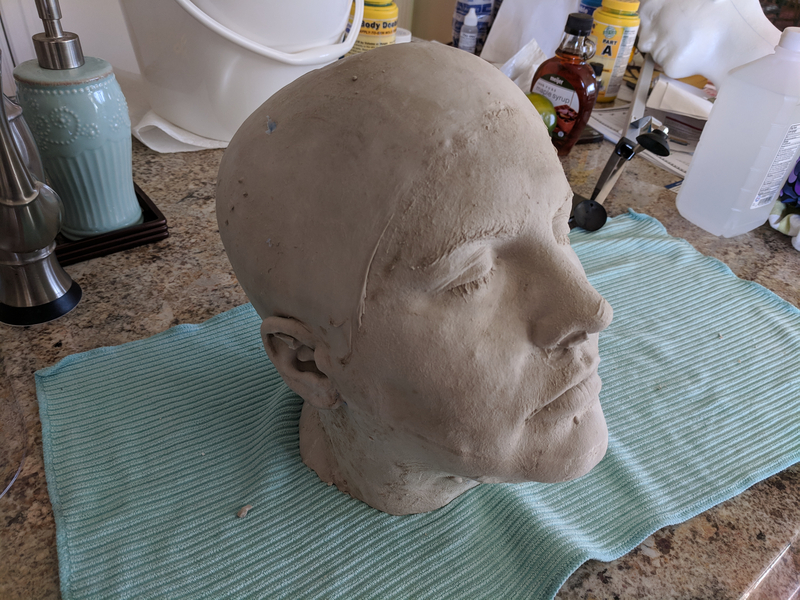 Do I need to wait for my bust to dry out before I begin sculpting? I did some beauty coat slips first and then followed with filling the whole thing. So I have a solid Ultracal bust. I know it's recommended to bake before foam latex, right? However, I am doing regular latex for my first mask (I was told it was more beginner friendly?) So I was unsure as to how soon I could begin sculpting. 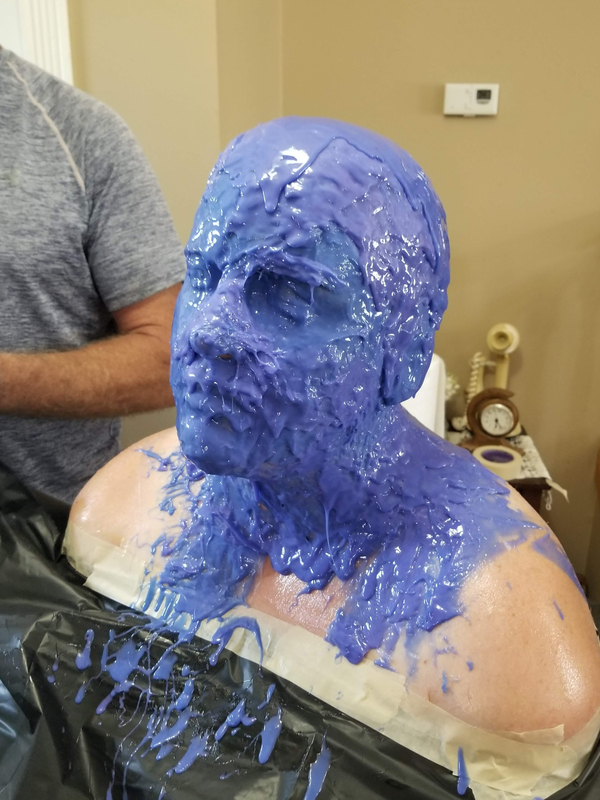 3) The Monster Makers guide recommended a thin layer of clay all over the entire bust along with the sculpt, to account for latex shrinkage. Is that the standard procedure? How much do you add? Thank you for any help you can provide a first timer! to 1) If this bust would be mine, i would let it fully dry, brush on a stone adhesive at the surface of the broken ear, taking epoxy putty and resculpting the ear into the putty. Otherwise if i only want to do a whole latex mask, i would fill in the ears twith clay anyway, because the mask has to go over the ears- then any details of the ears arent neccessary. to 2) I would let it dry and smooth out any edges before sculpting. to 3) I would use a pasta machine which gives me an even thickness of the clay and add about maybe 1 cm ( ~ 0,4- 0,5 inch) overall. It depends on, what kind of mask you want to sculpt on. Imagine: A pumpkinhead- mask would add over maybe 5 inches of mass overall- then the shrinkage is negligible. If you want to do applications- you have to sculpt them right on the lifecast. Thats only my opinion and my way to handle. Thank you for your reply! I think I will just not worry about the ear for now, then, since they will be covered. How long should I let the Ultracal dry? Days? Weeks? 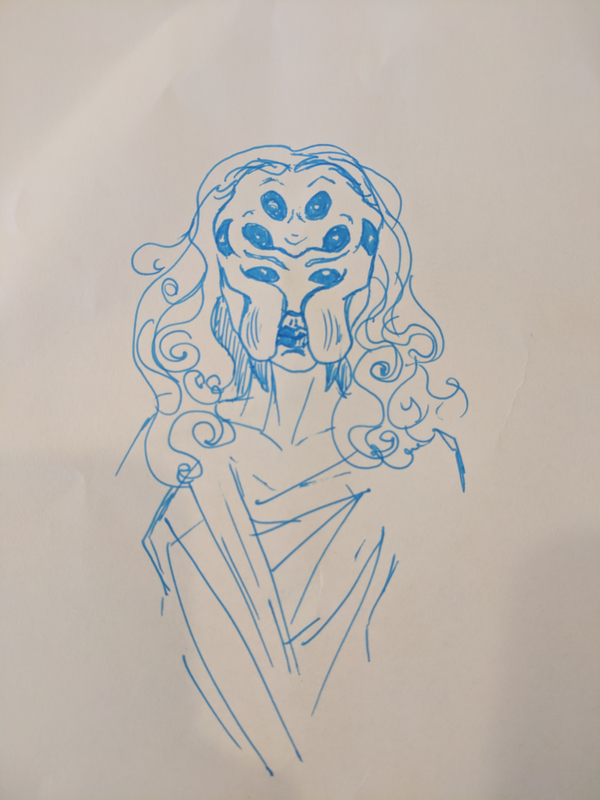 Also, thought I'd add my concept doodle that started this fun! it should be dry enough, when the surface becomes brighter than it was after the cast. It depends on humidity and temperature. I think to let a full cast dry about maybe 3-4 days should be enough. It also depends on which clay you want to use. If you want to use oilbased clays like Monsterclay, Chavant NSP etc. it might happen, that the clay falls off, because the steam from the drying process build a barrier between clay and the ultracal surface.